​We have been servicing southern California for quite some time. We are in the fore front in providing Pool Shade Sails in residential areas of the city. Why protect you and your pools with Shade Sails? For one, because we want to protect you and your family from jumping into a very hot swimming pool and get harmed. Instead of cooling off you might get a splash of hot water in your pool. Pool Shade Sails will provide you and your family the total protection you need. Our Pool Shades are made of high end quality fabrics made of polyethylene materials and made safely and water proof for total protection of your family in your pools. Our Pool Shade sail covers come in different sizes according to your pool dimensions. 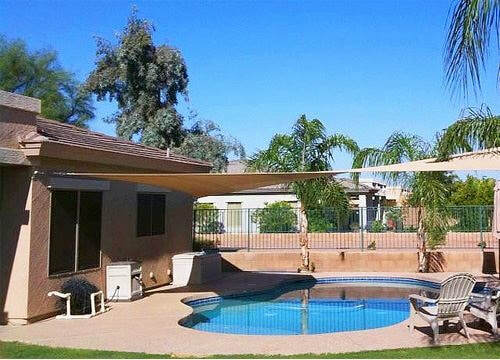 Cali Shade Sails has been providing pool shade sail covers in Ontario, CA and Riverside City. We have been in these cities and have provided pool owners their needed protection. Pool Shade sail covers are available in different colors that will suit your taste. Our pool covers are made in high end pool safety standards of the country. Our materials are non – toxic and easy to install. We have also an array pool shade sail designs for your selection. Our pool shade sail covers will be delivered to according to your specification, design, color and deadline. We have been in business of providing pool shade covers in years. Our Expert personnel are well trained and reliable. The integrity of our company has been tested by time and we have been receiving various commendations and compliments from our clients. We have accomplished almost all pool shade covers in every city. Our pool shade covers comes in various sizes according to the exact dimensions of your pool. We offer residents of pool owners in the area free consultation and assessment. We also offer the same benefits of free inspection and assessments for pool owners in Rancho Cucamonga, CA. We will be right away at your Villas to make inspection of your pools conduct cost estimate assessment with you and to discuss details of your requirements. We guarantee you, we are number one in providing your family the best and high end Pool Shade Sail cover in the whole State of California. The risk of your family playing in uncovered pool is very high. Your family may be at high risk jumping into a very hot uncovered pool. Call Cali Shade Sales for your needed pool shade Sail cover and protect your children from unprecedented harm. We love what we do because our primary concern is to protect your family and love ones. Cali Shade Sails is also urging pool owners of the City of Riverside, CA to contact us immediately if your pools are left uncovered in this soaring summer heat. Your children may jump into the pools unprotected by the UV rays. Our top priority is keeping your family cool and safe - we are happy to provide your family the best in Pool Shade Sail covers available in the country today. Contact us today to request a free estimate.